Interests - Dolls, Role Play, Colouring, Brownies, Cooking, Fairies, reading simple books, learning times tables, Dr Who and collecting the stickers. Hannah’s Dad Roger had NF1, and passed away from cancer when Hannah was 2. She was diagnosed with the same condition a week later. Hannah initially was affected very little by her NF, she had the brown patches (Cafe-au-lait spots) and there was a slight symmetrical difference in her face which you couldn’t quite put your finger on. Over the following years we discovered that Hannah has a Pleziform Neurfibroma tumour above her right eye and another one on her back, the Sphenoid bone at the back of the orbit is the wrong way round and learning difficulties which are associated with NF1. Seeing Hannah every day reminds me so much of Rogers condition. 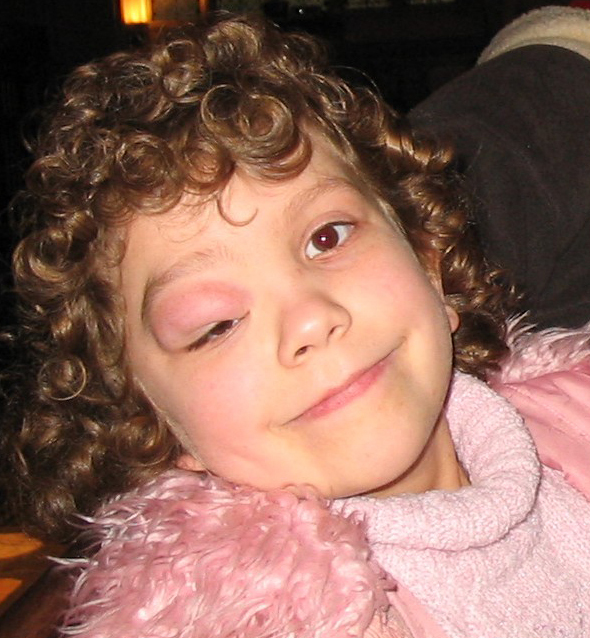 Hannah’s sight has been affected by the growth of the tumour. Hannah has had a few scans but these are not done often as she has to have general aesthetic so she lies still, the consultant is reluctant to over prescribe them to children. Hannah has regular eye checks; she has to have drops in her eye so the consultant can see to the back of her eye. Hannah hates this and screams. It’s hard as a parent to have to see your child hurting. Hannah has learning difficulties and gets help at school; it’s very common for NF1 patients to have a spectrum of learning difficulties. Hannah tries very hard but easily becomes distracted and frustrated. Her behaviour can be difficult for others to handle, especially in a new situation and with new people. The tumour above Hannah’s eye has got to a size where it is impacting on her sight and the older she is the more she notices what other people think about the way she looks. She has had some hurtful comments from children and adults especially when we are away from our home town. Therefore Hannah and I have decided for her to have an operation to de bulk the tumour. This brings risks but will hopefully improve her quality of life. NF is such a varied condition from one person to another, there is no start, middle and end, you never know when another tumour is going to grow, how you’re going to be affected or when. It is very like a roulette wheel. Hannah is doing well and is going for regular check ups. As those of you who are familiar with Neurofibromatosis will know, the condition is very much a lottery as to what is around the corner. I live in hope that all will be well for Hannah for the foreseeable future. Hannah, Matthew and I would love to thank you all for your support, cards, letters and gifts over a difficult time for Hannah. To keep updated with Hannah please visit our web page www.elizabethtucker.co.uk Once again, thank you. Hannah is doing well and is having regular check ups. Her eye sight has not got any better; however, there is no deterioration in her eye sight since her operation. Hannah is going on cub camp this weekend! Hannah has an appointment in Manchester with surgeons and eye people next month; we will let you know how it goes. Hannah has started singing lessons which she really enjoys. She is going for an interview today to join the academy which meets on a Saturday. It involves 1 hour of dancing, 1 hour of singing and 1 hour of drama to help build confidence. Hannah has been to the orthodontist this week to see about having a brace. She had to have an x ray and is waiting for her next appointment to have a mould taken. I’ve just returned from Florida and met Mickey Mouse and the Princess it was so exciting. Saw manatees in the river although I was too scared to get in the water and swim with them. The Disney Parks were brilliant, especially for children like me with special needs. I had a card that I presented at the start of every ride and where available I was able to use a different entrance so that I didn’t have to stand in line as long. I find that very difficult. The Disney Parks were also very helpful – better that some of the other parks in Orlando. On day 13 I was very tired and could not walk any further, so we hired a wheel chair which was brilliant for me. Mum thought I had done well to walk as much as I had as I’m not the best walker in the world and I get tired very easily. Access with a wheel chair is brilliant all over the theme parks. For some rides you have to leave the chair at the entrance and transfer on to the ride a short distance, but on the whole you can take the chair with you. I loved every moment of Florida. Hannah is till doing ok apart from a few headaches and a little swelling in eye. We hope to have a check up soon. We’re going to Florida in 4 weeks and it’s very exciting. Watch out Mickey, we are on our way! We have just been to London to see the show The Sound Of Music and to visit London Zoo. Hannah loved it! Hannah has also just passed her green colour swimming skills certificate. Hannah is still doing very well. She still has discolouring around the eye but the swelling has gone down. Thank you to those who sent Matthew birthday cards. He feels left out with his sister and her condition requiring so much attention. A week to go until Hannah’s operation. She has no colds or viruses so we are hopeful it will go ahead next week. They are de bulking the plexiform tumor.